Photos in Bill Gordon's trolley book on the line from Corning to Elmira to Waverly, show the trolley right next to the Erie in many place, especially between Elmira and Waverly. The trolley even used the same bridges at times. Was the trolley bed, after it was removed, ever incorporated in the Erie's roadbed? 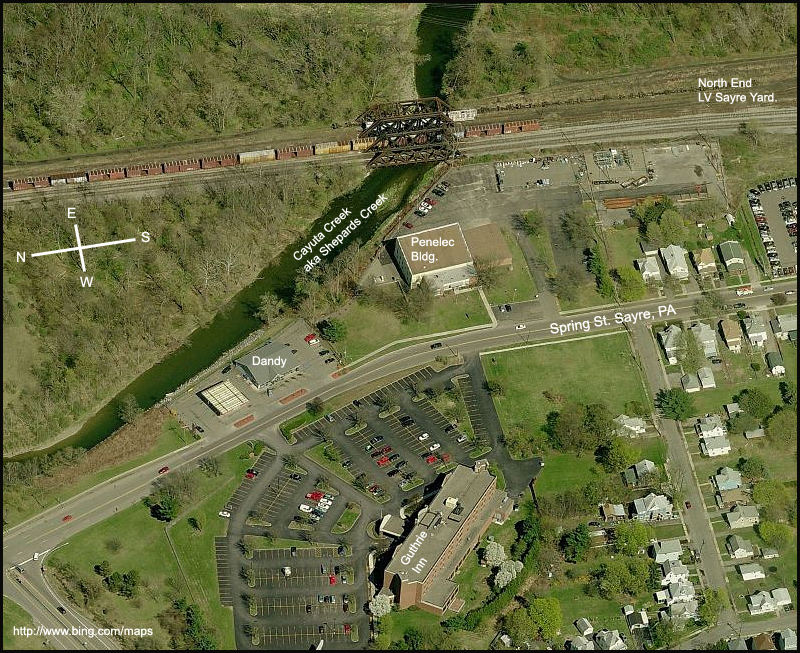 Some photos or postcards show it close like the LV and Erie between Binghamton and Owego: a "stone's throw away". Other times it's like the Erie has a 3 track main. Did the Erie take over any trackage to service any businesses? Last edited by nydepot on Mon Apr 26, 2010 6:13 pm, edited 2 times in total. I'd like to see the answers to those questions, too, as my late father rode the trolley as a very young boy. Also, it should be noted that the trolley ROW was separated from the Erie by several miles between West Elmira and Corning (unlike the trackage east of Elmira). Last edited by Matt Langworthy on Mon Apr 26, 2010 10:15 am, edited 1 time in total. I know between Corning & Elmira it followed the river, far removed from the Erie & DL&W tracks..
then between Chemung & Waverly it was also not near the Erie tracks..from Chemung it headed up over the hill, where O'Briens resturant is, then back downhill to Waverly..
so that only leaves Elmira-Chemung where it was next to the Erie tracks..
im not sure of the exact routing..I have been meaning to dig into it, but havnt done it yet.. I have started a webpage for the WS&ATco, but I dont have it uploaded yet.. I dont know the answers to those specific questions! but I would like to find out as well.. I know the EC&W shared the Erie bridge over the river, just west of Chemung..other than that, im not sure of the exact route of the interurban tracks. This is the narrows just around the bend from Waverly, to the west. That's the Erie main next to the river and the trolley up and next to the Erie. It's not up on the hill by O'Briens. I'm not saying there wasn't a spur to O'Briens maybe, but the main track of the trolley was down next to the Erie. Per usual artist touch back then,the trolley poles are all in place but they removed the arms and wire so you could see the beauty of the hills. it must have run both ways, at different times..
there is a photo, I think in the book you mentioned! I dont think I ever heard of the tracks following the Erie directly west of Waverly..
thats a new one for me! route 17C up over the hill doesnt exist in 1902! the only road between Waverly & Chemung is the "River Road"..
Perhaps originally the interurban tracks ran along the Erie..then once the road over the hill was built, they then followed the road up over the hill, then ran straight through "downtown" Chemung, then re-joined the Erie route just west of Chemung, just before the big Chemung river bridge. I think the tracks went down the hill which is now a farm road, just west of the Chemung race track..
or..perhaps it was just a spur up the hill to Obriens? I always assumed the route went up and over the hill..im not sure why. but im sure *some* tracks went up that hill..perhaps its wasnt the mainline however..hmm..
Last edited by scottychaos on Mon Apr 26, 2010 2:17 pm, edited 2 times in total. I'll look tonight in the book. The trolley was owned by the Erie. It was opened in 1911 and closed in 1930. I can't imagine the trolley company wanting to forgo easy grades (next to its parent) for a monumental climb up and over that hill along with another gully west of this postcard view. By the end of WWI, it's already starting its fall financially. nydepot wrote: I'll look tonight in the book. The trolley was owned by the Erie. It was opened in 1911 and closed in 1930. I can't imagine the trolley company wanting to forgo easy grades (next to its parent) for a monumental climb up and over that hill along with another gully west of this postcard view. By the end of WWI, it's already starting its fall financially. Check out the photos on that site- there are alot of cool vintage shots in there. So far in Gordon (page 102) EC&W is parallel to the Erie from Wellsburg to Waverly. The on private ROW from Wellsburg to Elmira. OK, I finished the rest of Gordon on it. EC&W was built along the Erie from Wellsburg to Waverly with the exception of some street running at Chemung. The photo in Gordon's book Scot references says "EC&W right of way on left, O'Brien's on Waverly Hill above Erie No 831" THe photo is taken from the opposite direction of the postcard I posted. No rebuilding of the line at any point. It was completed fully in 1911 and had great business but 1912 was its banner year. From there it was all decline. Then from the map, the EC&W never went up the hill to O'Brien's at any point. It just came in and connected with the street railway in Waverly. The Waverly, Sayre & Athens street car line didn't go to O'Brien's either. That clears that part up. And I know you hate redoing the maps Scot! I will have to get that book out the library again..
"EC&W right of way on left, O'Brien's on Waverly Hill above Erie No 831"
I dont see how that is 'the opposite direction" of the postcard you posted..
because the Erie tracks are nowhere in sight, and its clearly streetcar tracks on a steep hill..
or am I losing it? 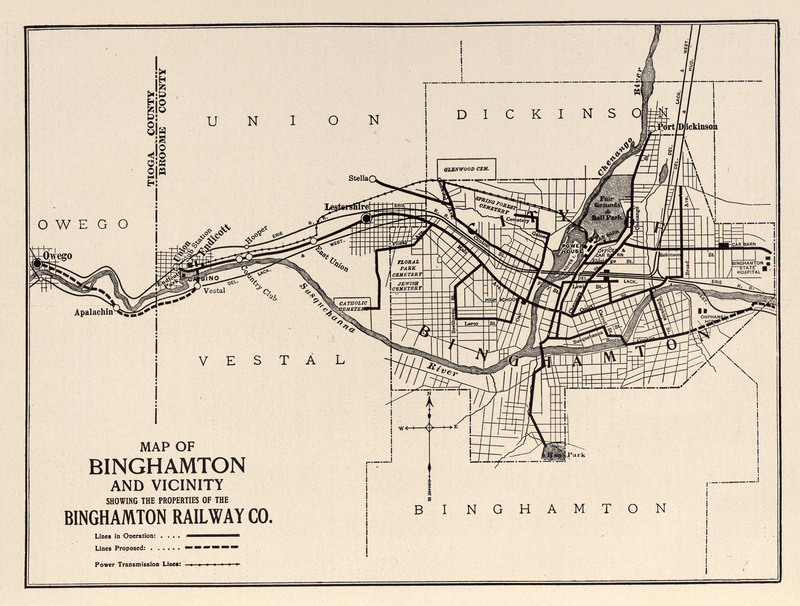 I dont have the photo in front of me, so maybe my memory is jusy hazy..
On a somewhat related note..
does anyone know if a streetcar line ran from Binghamton all the way to Owego? the maps says "proposed" line to Owego..but the map is not dated. Did Owego ever actually have a streetcar line? but this was never done..
im just wondering if tracks extended from Binghamton to Owego..
Postcard posted earlier shows from L-R, the river, Erie 2 tracks, ECW 1 track, Waverly Hill. Postcard "taken" down at RR level. O'Brien's is above photographer, out of view. Photo in Gordon's book shows from L-R, Waverly Hill, ECW ROW, Erie 2 tracks, river. Photo taken down at RR level. O'Briens is a dot on the hill. No steep tracks on a hill in that location. There is photo of the trolley on steep tracks on a hill taken above Elmira. That's probably what you are thinking. In the Triple Cities Trolley book by King, I don't see anything about it being built to Owego. Scotty, the WS&AT carbarn in Waverly,...where is/was that from the current Dandy Mart on Spring St?? Any other visible remains of the line in Waverly? CarterB wrote: Scotty, the WS&AT carbarn in Waverly,...where is/was that from the current Dandy Mart on Spring St?? Any other visible remains of the line in Waverly? The carbarn actually still exists today! its actually the Penelec building! Long standing Valley legend says the Penelec building is actually the car barn! although its been so heavily modified and renovated over the years, that today no traces of the original car barn exterior are visible..
actually, I have always been a little iffy on that legend personally..
because the two buildings have nothing in common today..nothing matches..
although heavy renovations could explain that..
and also because historic photos of the car barn seem to show the barn much closer to spring street than the Penelec building is today..
although if the trolley tracks were along the side of spring street, rather than down the middle of it, it could fit the photos..
its difficult to tell...but thats the story I have heard my whole life! everyone at the old Valley Railroad museum always said the same too..
apart from that building, I dont believe there is the slightest trace of the streetcar system anywhere else in the Valley..
Resided in Owego, NY through my junior high and high school days, E-M 1950s. Never heard any talk of a trolley line in the village. There was never a interurban line serving the village, as well. Notice that the tracks leave the building, and immediately turn north and south on Spring street..
Today, the current Penelec building is set further back from spring street..
a. Perhaps the tracks in the historic photos are alongside Spring street, not IN Spring street. Running through the area that is now the "front lawn" of the current Penelec building. of what was once the rear portions of the car barn. and penelec could have naturally taken over that part of the operation in the 1930's when the streetcar line shut down. d. Perhaps the location of Spring street has shifted somewhat? There has been a lot of street work done in this area..
south of the Penelec building, which are likely 100 years old or more.. Personally I believe "b" is the most likely..that the original "front" of the car barn likely no longer exists, but rear portions of the car barn, maintenance shops and electricty station, could be part of the current existing building.